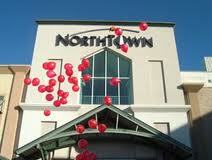 Northtown is located at the intersection of Division and Wellesley, along with a movie theatre and Chilli's Restaurant it is anchored with a Sears, The Bon Marche, JC Penney, Emporium, Mervyns and Nordstrom Rack. Other stores are Bombay Company, Disney Store, The Gap, Sam Goody, Barnes and Noble, and dozens of other boutique stores. A block to the south you will find an Office Depot and across the street to the west there is a large golf store, Wide World of Golf. 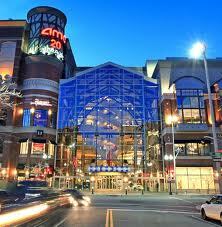 River Park Square is anchored by a Nordstroms right downtown at the corner of Main and Post. Connected to this large store are skywalks that interconnect not just a large portion of the shopping district, but most of downtown's office buildings as well. Along with Nordstroms you can walk to The Bon Marche, the other large downtown department store. Within the mall you have a large movie theatre, Williams Sonoma, Pottery Barn, Restoration Hardware, Eddie Bauer, The Gap, a small food court, at least 18 other small boutique stores and a few restaurants such as The Sawtooth Grille (hamburgers, chicken and sandwiches) and Chevy's (Mexican restaurant). Across the street from the mall is a Red Robin (hamburgers, chicken and sandwiches). Spokane Valley Mall is located between the Evergreen and Sullivan exits on the north side of the freeway (I-90). This mall, along with a large movie theatre, is anchored by a Sears, Bon Marche, and JC Penney Store. Along with the dozens of usual boutique stores you will find Champs Sports, Cinabon, Footlocker, The Gap, and Ben Bridge Jewelers. Surrounding the Mall there is also shopping at Barnes and Noble Bookstore, TJ Maxx, Linens and Things, Old Navy and Pier 1 Imports. Places to eat surrounding the Mall are a Red Robin, Outback Steakhouse, Black Angus, Boston Pizza, Arby's, Tony Roma's and just across the street form the mall is the Pacific Northwest's only Krispy Kreme Donut shop. On the north side there is Shadle Center, Franklin Park, and Northpointe; south there is Manito Center and Lincoln Heights; downtown there is The Flour Mill. Shadle Center is located a few blocks west of Maple and Ash on Wellesley; it is anchored with a Wal-Mart and also has a Safeway grocery store, McDonalds, Blockbuster Video and Rite-Aid drug store. Franklin Park Mall is just a few blocks north of Northtown Mall (and north of Wellesley) on Division; it is anchored with Burlington Coat Factory, Ross Dress for Less, and has an Outback Steakhouse. Burlington Coat Factory is not just coats, it is a large discount department store, it is best known for it's incredible selection of baby clothes and accessories. Northpointe is pretty big, it is on the Newport Highway as you branch to the right at the Division 'Y'. 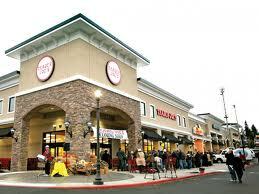 Stores here include Target, Best Buy, Sports Authority, TJ Maxx, Shopko, Bath and Body Works, and Petsmart. Some restaurants in this complex are Red Robin, Olive Garden, Azteca, Taco Bell, and Subway. Manito Center is at the corner of 29th and Grand Blvd., it has one large department store, Gottschalks, a Rite-Aid drug store, a grocery store and several banks. Lincoln Heights Shopping Center is at the intersection of 29th and Regal (25 blocks east of Grand Blvd. ), here you will find two grocery stores, a fabric store, Hastings Books and Videos, bowling alley, Rite-Aid drug store, Miller's Hardware store (small but great), and several restaurants including McDonalds, Zips, and KFC. Trader Joes came in in 2010 too! The Flour Mill at W. 621 Mallon is actually on the north side of the Spokane River across from downtown, next to the Arena. This is a charming old 100 + year-old brick build with specialty shops including a tobacco and pipe store, glass art store, pottery art store and kitchen store. You will also find Spokane's most popular restaurant, Clinkerdagger's, there along with a great sandwich shop and Ho Ho Terriyaki, a great place for a fast lunch. To get there, cross the Monroe Street Bridge from downtown and take a right at your 2nd light (Mallon), you will see it about 4 blocks down on your right. Or, you can walk through Riverfront Park, it sits on the north-central edge of the park. There are antique stores in several areas. On North Monroe, from the moment just after you cross the bridge from downtown you will find several stores all the way north to the point that you approach the steep hill that takes you up to Garland. From about the 1300 block on East Sprague for about 3-5 blocks there are a couple stores. On North Market in Hillyard, just beyond Wellesley there are many antique stores to choose from. And finally, downtown on Main and Riverside there are a few stores between Division and Washington. The General Store (2424 N. Division) seems to be the perennial favorite for the avid fisher or hunter, they also have boots, camping gear, water skis, outdoor clothing, auto parts, and just about everything except groceries. A few blocks south is the White Elephant (1730 N. Division), similar items as The General Store, just a smaller selection. They also have a bigger store in the Valley at 12614 E. Sprague. For the mountain climbing enthusiast there is an REI at the corner of Monroe and Boone (12 blocks north of downtown) and Mountain Gear at 2002 N. Division (or if going north on Ruby, the corner of Baldwin and Ruby, one block north of Indiana).